I made a very last minute visit to the library tonight. I wasn't sure if I was going to make it or not. Part of the reason is that I knew that I had 8 items to pick up, 3 spaces on my card, and only 4 items to take back, so there was no way known I was going to be able to pick them all up. When I went to the counter I told the librarian that I had left one item on the hold shelf because I didn't have enough space, to which he replied they were just guidelines, and so he let me borrow them all. There's every chance they are going to regret letting me know that they aren't rules as such! Provocative in Pearls by Madeline Hunter - The second book in the Rarest Blooms series. Pyramids by Terry Pratchett - the next Discworld book. 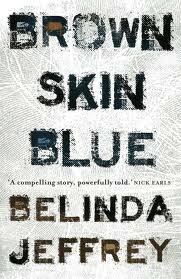 Brown Skin Blue by Belinda Jeffrey - I read an awesome review of this book at Inkcrush, and had to request this book straight away. The Red Necklace by Sally Gardner - I won a copy of the second book in this series last month, but can't possibly read a series out of order, so had to borrow this one to read first. The Savage Sky by Emma Drummond - This author was mentioned in the Sweeping Sagas group at Goodreads, so I thought I would try out the one and only book that the library has by this author. The tagline is Allies in War, Bitter Rivals in Life - sounds like exactly my kind of book! A Secret Affair by Mary Balogh - The final book in the Huxtable quintet. 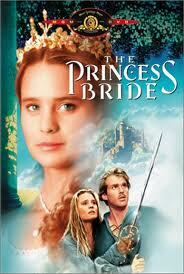 The Princess Bride DVD - After finishing the book, the next obvious step is to watch the movie. What loot did you get from the library this week! Add your link to Mr Linky below so that we can all come around and have a look! I love The Princess Bride. It's the cutest movie, something to watch for warm and fuzzies! I also loved The Princess Bride as a movie. I'm noticing that quite a few people have gone in the readalong. I must inhabit an odd little corner of the book blogosphere where I miss out on readalongs! Good loot! I've seen the movie Princess Bride a million times but I've not read the book. The Red Necklace looks intriguing. I am going to have to do some research on that one!! Great loot you got there! I'll be interested to hear about the Red Necklace. Sounds like something I would like. I love when the library gods conspire to let you pick up all your books! I'll be interested to hear what you think of the Princess Bride movie as compared with the book. I've seen the movie but not yet read the book. Enjoy! Since my library is self checkout via computer I doubt I'd get away with that so easily. I just picked up two Drummond books as well. Looking forward to it. Ooooh, ahhhh, Richard Armitage. Did you hear that Peter Jackson's got him signed up for The Hobbit as Thorin Oakenshield? Could be interesting. Great loot - nothing like picking up a pile of holds. 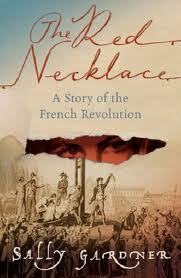 The Red Necklace sounds my sort of thing - will have to check my library catalogue. 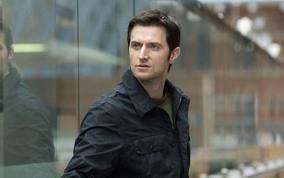 Oh Richard Armitage...As ridiculous as "Spooks" gets, I can't stop watching, not as long as he's on it. I think I will have to also check out Brown Skin Blue - thanks for sharing! I still need to read the book though! I really want to read the Discworld series, but I haven't made it past the third page of the first book yet. One day, maybe? That's so great that your library gave you all your holds because they didn't have enough room on the shelf. I love that! LOL! I'm enjoying Madeline Hunter's Rarest Blooms series. I'm looking to read the third one soon. And it's a very good reason indeed!